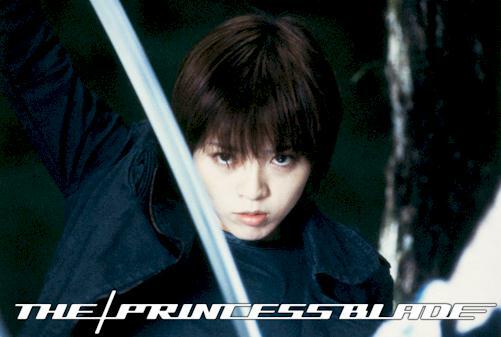 Yumiko Shaku stars in The Princess Blade. The Skinny: A disappointing sword movie from Japan, The Princess Blade could have been helped greatly by a director and actors more comfortable with the genre. Don't pop this one into the player if your looking for light entertainment, either. A middle-budget production by a largely unknown director, The Princess Blade takes place in an unknown country sometime in the future that has regressed to an isolationist society, both stagnated and violent (basically a modern feudal Japan). The title character, Princess Yuki (Yumiko Shaku), belongs to a band of assassins with fantastic sword skills who are exiles from their own country and now work for the ruling dictators of their new one. However, Yuki quickly discovers that her leader may be the one who killed her mother years before, and after confronting him with this information finds herself on the run and hunted. Enter Takashi, a hapless rebel against the government who aids Yuki such that she might seek revenge on the group that now wants to kill her. The plot doesn't go much farther than that, other than the requisite fights and easy plot twists. The action takes place in a few remote sets (mainly Takashi's dilapidated place and the surrounding forest) with a few CGI backdrops that hint at the future society around them. To pad the film out to ninety minutes, we have a futile relationship between Yuki, Takashi, and his mentally scarred sister, Takashi's uneasy relationship with the rebels, and a small amount of back story. But we don't watch movies like this for a gripping story; we watch them for eye candy, decent acting, nice fights, good direction, and something that we'll remember an hour after its done. For eye candy, first-time actress Yumiko Shaku is cute and a fine actress, but she's just not built for an action role. Many of the fight scenes use a stunt double, which is just as well as she otherwise has little physical presence. Occasionally she can scowl pretty well, but there are several cases where she can't pull off the tough-as-nails persona. Her character isn't convincing either; though she's supposedly one of the best assassins in an organization of assassins, she frequently gets the stuffing kicked out of her, and several times barely escapes with her life. As far as direction, Shinsuke Sato is obviously skilled in framing shots of misty forests, calm lakes, interesting objects in the background, and the generally quiet techniques of a more sedate film. But, there are some directors who treat action like great art and those who haven't a clue. This director is unfortunately closer to the latter. The sometimes solid action frequently can't overcome unphysical actors (and some very obvious doubles), choppy editing, and continuity problems. This is not to say that all the action is bad. Some of it is actually pretty good, though there are occasional problems. Each fight has a number of little things that seem wrong. Sometimes an actor can't quite pull off the moves, or the edits are too fast. Sometimes a blade that's just been shoved through a person is clean the next second, or the sword hilt in Yuki's hand looks comically large and unusable for her. Add all these things up, and the filmmaking just looks sloppy. Furthermore, there's never any setup for the fights. In two of the main fight sequences the bad guys appear without warning, nor is any reason given for how they even found Yuki. It's interesting to note that though Yuki is supposed to be seeking revenge, not once does she actually have to seek out her enemies or her mother's killer. Some might disagree with my other problem with The Princess Blade: that Donnie Yen should not have been hired to do the action choreography. There is something very incongruous about people wielding katanas and facing off like combatants in a classic samurai film, who then break out with a flurry of wire-assisted kicks, wushu moves and tactics. Japanese cinema has a rich tradition of swordplay, with its own unique style and pace, and this mixture certainly isn't it. The katana isn't a one-handed tai-chi sword, and the swordplay shouldn't look like Chinese fencing. But the fighting in The Princess Blade looks exactly like the fighting found in any handful of period Hong Kong kung fu movies. The actors and doubles can't seem to handle the fighting, the director doesn't seem to know how to film it, and while it wasn't bad or even wrong to try, the clash of styles ultmately seems generic and, well, odd. It seems like The Princess Blade was just another attempt to cash in on the perceived bankability of Hong Kong choreography, but in this case it simply didn't work. Notes:  The Princess Blade, called Shurayuki-Hime in Japanese, is loosely based on the classic 1973 chambara Lady Snowblood, which was also titled Shurayuki-Hime. The latter film is definitely recommended and can usually be found any video stores with a good foreign section.